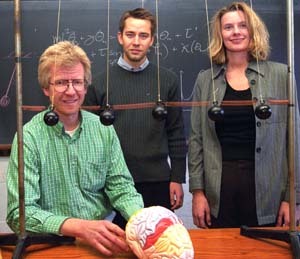 Wessel (left), Brandt and Dellen with “oscillating” pendulums. “According to a computational study conducted by a group of physicists at Washington University in St. Louis, one may create order by introducing disorder. While working on their model — a network of interconnected pendulums, or “oscillators” — the researchers noticed that when driven by ordered forces the various pendulums behaved chaotically and swung out of sync like a group of intoxicated synchronized swimmers. This was unexpected — shouldn’t synchronized forces yield synchronized pendulums? But then came the real surprise: When they introduced disorder — forces were applied at random to each oscillator — the system became ordered and synchronized. “The thing that is counterintuitive is that when you introduce disorder into the system — when the [forces on the pendulums] act at random — the chaos that was present before disappears and there is order,” said Sebastian F. Brandt, Washington University physics graduate student in Arts & Sciences and lead author of the study, which appeared in the January 2006 edition of Physical Review Letters.